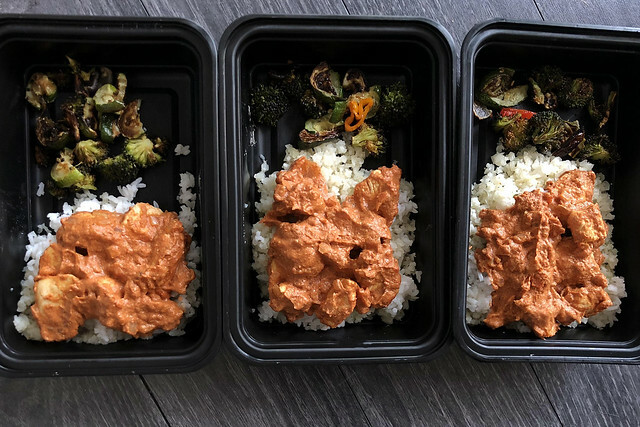 I've been incorporating a little meal-prepping into my routine for awhile now (nothing too crazy yet), and was excited when I came across this recipe to add some new flavors to me usually weekly lunches. If you make it as described below it isn't the healthiest lunch option but with a few easy changes it fits the bill for sure. I used low fat greek yogurt instead of heavy cream and served over cauliflower rice with roasted veggies. The sauce was heavenly! Original recipe is from Gimme Delicious Food. To cook butter chicken: Heat a large skillet or medium saucepan over medium-high heat. Add the oil and onions and cook onions down until lightly golden, about 3-4 minutes. Add ginger and garlic and let cook for 30 seconds, stirring so it doesn’t burn. Add the chicken, tomato paste, and spices. Cook for 5-6 minutes or until everything is cooked through. Add the heavy cream and simmer for 8-10 minutes stirring occasionally. To make naan: Combine the garlic, butter, cilantro and butter in a small bowl. Set aside. Divide pizza dough into 8 equal portions. Roll the dough into a small circle using a rolling-pin. Heat up a skillet (cast-iron preferred) over high heat and lightly grease the surface with some oil to avoid the dough from sticking to the skillet. Place the dough in the skillet. When it puffs up and bubbles and burnt spots appear, flip it over and spread with the garlic butter mixture. Cook until done. Repeat the same until all dough is done. To cook rice:Wash rice until it runs clear then rinse. In a saucepan bring water to a boil. Add rice and stir. Reduce heat, cover and simmer for 15 minutes. Turn off heat and let stand for 5 minutes. To Assemble: Measure 1 cup of cooked rice into each meal prep container. Pour about 1 cup of the butter chicken on the rice. Wrap a naan with foil or plastic wrap. To heat, microwave containers for 2 minutes or until steamy. Microwave naan for just 20 seconds.